You, a former resident of the municipality of Watertown, of the County of Jefferson and Commonwealth of Wisconsin, are hereby commanded and directed that laying aside all and your every duty and purpose to the contrary, you pack your knapsack (no rations necessary) and begin your march in ample time to rendezvous at the aforesaid municipality of Watertown, in said county and commonwealth, not later than Saturday and Sunday, the 5th and 6th days of August, 1911. You shall come prepared to be met by volleys of welcome and hearty greeting from your old friends and neighbors, by whom your name was requested to be included in these marching orders. You are assured that the two days’ campaign will be strenuous with pleasure and delight, and as joy never kills, you may confidently expect to return to your home again, carrying with you the happiness of knowing that old Watertown and her people remember you. No excuses except illness will be sufficient for failure to comply with the marching orders herein given. 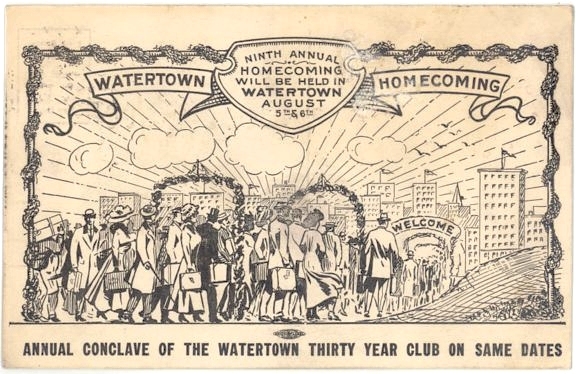 The Thirty Year Club will gather in Watertown on August 5 and 6 in conjunction with the Homecoming gathering. Friend: Our old Mother Watertown again invites us to come home and partake of her hospitality on August 5 and 6. Have you ever asked yourself, "What is the spirit of homecoming?" Answer, "Ah, the good old days when we were young and youthful." Those words are always spoken with a reminiscent sadness, and if there was not a lurking sentiment from the splendor of good fellowship, from the charm of simplicity and the peace that comes from a contented heart that marks our homecoming festival, then there would be no regret for the days that are gone. But they are conjured back again at our annual gatherings when we cherish the generous spirit of our "old home" festival; the gathering together of families making sacred the beauty of the home ties and once more living the days of our boyhood in our old boy day town. In Watertown there is now a hustle of preparation going on. The pantry shelf is heaped up in plenty with good things to eat and there will be games and sports from the rising of the sun on the morning of August 5 until the shadows of evening close around on August 6. Come home you who were one time boys . . . stubtoed and freckle-faced, who had stone bruises in summer and sported copper toed boots in winter; you boys who never wore a Fauntleroy collar, but who was always empty and waiting for crullers and dried apple pie. Come home and bring with you she who was once a little girl in sun bonnet with old fashioned "tyer" and little trim pigtails down her back, giving her another opportunity to make mud pies, hug the old rag doll with a bit of fringe from mother's dress for hair, play "pomp-pull-away" and “tag," believe once more dandelion fluff and buttercups under the other girl's chin. Come home, once more and eat your breakfast of hot "riz" pan cakes right off the griddle, and a supper of a big bowl of old fashioned "stir-about" on the old drop leaf table in the kitchen. Plans for the ninth annual homecoming in Watertown are complete for the dates set, August 5 and 6. The big gathering will be held on Tivoli Island on Sunday, August 6, where the address of welcome will be delivered by Mayor H. G. Grube. The homecoming address will be made by Attorney Lynn H. Smith of Jefferson, a fine speaker, and well able and capable of handling the subject. Those who have listened to Mr. Smith’s oratory on previous occasions declare there is a treat in store for the homecomers. Three bands of music will furnish the inspiration, the Watertown Military Band, the Imperial Band and Winninger Bros. Theatrical Band. This will afford ample music and keep the homecomers in good spirits. The decorations are now being looked after by a committee which understands such matters and that they will be elaborate and satisfying goes without saying. The program for Saturday evening has not yet been announced but the Sunday program will be in the usual form. Watertown’s last annual homecoming was observed last Sunday. With the final dance at Tivoli Island Sunday night and the final greeting between those who came this year to renew old ties, one of the most unique of like celebrations ended on its ninth anniversary. In the future, according to the present plans, homecomings will be held bi-annually, or as the officers of the Watertown Homecoming Association see fit. In enthusiasm and spirit Sunday’s homecoming lacked nothing. On Saturday night visitors began to pour into Watertown, and the annual night parade of illuminated automobiles, with red fire and fireworks attendant upon it, saw Main Street crowded to capacity. Automobiles in the parade that attracted special attention were the ones occupied by the nurses of St. Mary’s Hospital, in white caps and gowns, and the auto labeled “Chicago,” which was very handsomely decorated. Early Sunday morning things were again astir, and until late all of the activity and excitement of renewed meetings, reminiscences of old days and queries of present affairs was evidenced. It was with three bands that visitors were greeted, and in a procession, headed by H. G. Grube and President Wertheimer, Theo. Kusel and P. J. Holland, were escorted to the homecoming headquarters from the NorthWestern and Milwaukee Road stations. The Watertown Military Band, the Imperial Band, and the Winninger Theatrical Band, each added its quota to the music of the morning. The five Winninger brothers are old Watertown visitors, and in this way added their bit to the celebration. The principal events of the day, as in past years, were held at Tivoli Island during the afternoon and night. Speeches and addresses, a band concert, dancing, and all the games and sports of an open air festival were there for the amusement of those who came to enjoy themselves. The homecoming address was delivered by Attorney Lynn H. Smith of Jefferson, who chose for his topic, “Homecoming and Its Associations.” Mr. Smith paid deep tribute to the love for one’s natal city, and eulogized the spirit and zeal which had done so much to keep alive the custom in Watertown. The address of welcome was given by Mayor Grube. Former Senator Charles Pettibone of Waupun also spoke, recalling incidents of pioneer days and old times. Previous to the afternoon celebration, a parade was held from homecoming headquarters to the island. All the noon hour, visitors started to troop down Main Street to the island entrance. Automobiles and vans were pressed into service; and when, at 1:30 o’clock, the procession formed before the headquarters, the grounds were well filled with an expectant gathering. With President Wertheimer, Secretary Theodore Kusel, and J. P. Holland, chairman of the publicity committee, leading the way, the marchers filed up Main Street to West Main Street, then turned on themselves and, reversing, marched straight for the island. The Imperial Band furnished the music and the speakers of the day, with Mayor Grube, were conspicuous in the ranks. While a large gathering of the Thirty Year Club was represented at the homecoming, no formal meeting of the organization was held. President John Bruegger, Williston, North Dakota, was unable to attend, owing to injuries received in a recent automobile accident by his brother; while Secretary Jas. Nellins, who worked earnestly for a large attendance, was prevented from attending. Instead of a business session, members contented themselves in gathering together and celebrating the day. The club is comprised of all who left Watertown thirty years ago. The attendance this year, so far as out-of-town visitors were concerned, was not that of former years. This is, however, accredited to the fact that recent attractions in the city brought the old residents here within the last few weeks, and many felt unable to return a second time after such a brief interval. Of all the visitors, Otto Rose came the farthest distance and from the north. He is a resident of Douglas, Alaska. Those of our people who attended the Watertown Homecoming, as well as all the homecomers, pronounce the annual meeting last Saturday and Sunday as most enjoyable. Nothing had been spared or forgotten by the committees of arrangement and entertainment to make this homecoming a marked event in local history and personal experience. While the attendance was hardly equal to what the management had hoped for in their desire for a bigger success than ever, they have failed to note how completely the thousands of homecomers and others appreciated and enjoyed the ample provisions that had been made for their reception and entertainment. Everything looked good to them.